This is a long history of my short flying career. Jumbo jet pilots keep a special log book for the plane and then another one for each engine - us paramotor pilots can get away with scribbling things down on the back of an envelope but I thought it would be interesting to keep one on the web. I went to a micro lighting show in Telford near Birmingham. It was great seeing all these crazy machines and I looked at (and sat in) just about everything. I challenge anyone to wander around the place and not buy something. 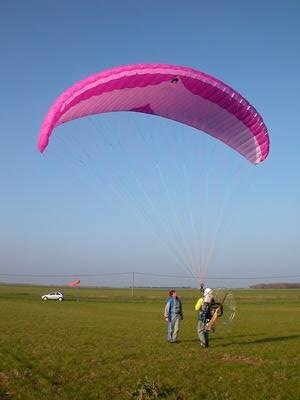 I bought myself a paramotor (a Fly Castelluccio energy 100) which I'm still very pleased with. 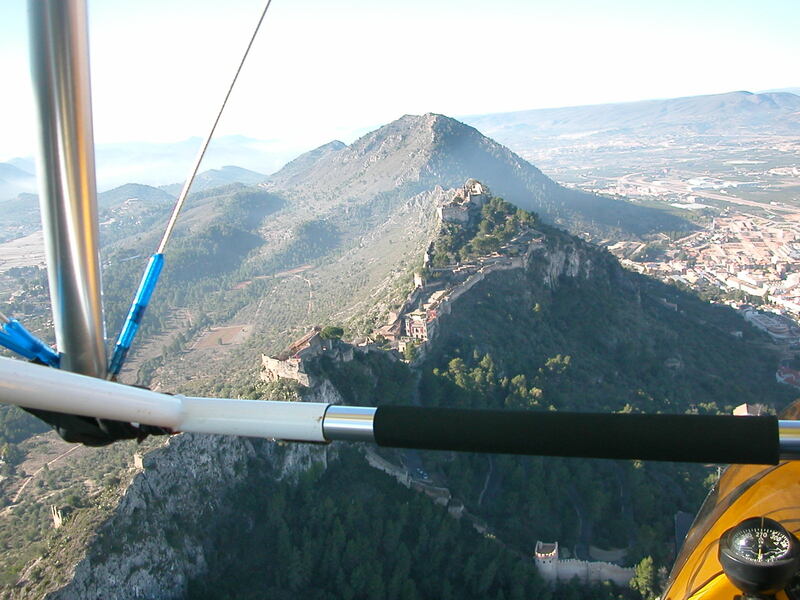 I also spoke with Mike Deakin of the paramotor school in France and have arranged a course for February - it actually looks like I'm finally going to learn to fly. I also managed to find a good wing, a Trekking Parawing, for a fair price second hand on the internet so now it looks like I'm all set. The weathers been unusally bad and we had to grab flying time when we could. In the mean time we had become quite good at ground handling in excessive conditions. Did a tandem flight with Mike doing the take off and landing. We flew for 40 mins and I found it much easier to fly than I thought it would be. Strangely the wings allways fly at the same speed no matter what but if you reduce the power it reduces height and vice versa. I couldn't get comfortable in the seat though, I felt I was only inches away from a dropping out (it turned out to be the straps for the end part of the seat being to loose) - in the end I had to ask Mike to land as I didn't feel my arms could fly the wing and hold onto the harness any longer. I practised in a harness on the ground to get everything adjusted - hopefully it won't happen again. I know I wasn't in danger but knowing it and feeling it is two entirely different things ! We tried using the engine on the ground just to get a feel for the thing - it gives out one hell of a thrust - you feel like you're holding a jet engine. Both myself and the other student, Dave, were very surprised (scared) by how much ooomph these things give out - worryingly the engine I have at home is quite a bit more powerfull again. Eeek. Must admit I'm very pleased with the way we're being taught - everything seems very logical and well paced - it's just a shame about this weather. I guess we're going to be experts on theory anyway. Learnt : not to sit down to early ! Let the wing pull you off the ground running. The weather has now calmed a little and we've gone from ground handling (forward and reverse) with no engine to the same again but with engines (turned off) and then with them turned on. It's exhausting playing with the wing and carrying a 25Kg motor on your back. Eventually it's time to attempt a solo take off - it's just like normal ground handling with the motor turned on but this time you squeeze the motor to full revs - this is very scary in all truth. There's a 30m2 wing up above your head and tugging you this way and that, the noise of the engine at full blast behind you, the propellor turning into a high speed bacon slicer whizzing around a few inches from your ears, the torque reaction trying to turn you the other way round and of course you're trying to remember everything you've been told. The main thing is having the wing stable above you, the engine on full blast and the brakes off. In a few feet I was sort of space walk along the ground and then I was flying - the contraption actually works ! I go for circuits round the big field but can't get into the seat at all (seats are becoming a bit of a problem for me - I'll have to check my behind in the mirror to see whether mines bigger then everyone else's). On the 4th circuit I'm beginning to go crossed eyes hanging by the straps between my legs and have to land. I managed to get into the seat too quickly on one take off, you feel the wing is starting to pull you up and your body tells you to just sit back and take off - what actually happens is the wing has only just started to lift and you then put all you're weight onto the poor thing and drop the back of the cage through the grass (if you're lucky) at full throttle - probably why school propellors are allways green at the tips. I'm told to keep running until I'm well of the ground. A small touch on the brakes also helps to unstick you from the ground. Another take off goes t*ts up when I trip on take off with full throttle and nose dive into the earth. I hit the stop switch so hard that I tore it off the handle - sorry Mike. Actually managed to get into the seat this time and its amazing how much more peacefull everything becomes when you feel properlly attached to the wing. I'm still going round and round the big field but I felt happy to stay up there all day. I felt quite at peace with the whole unit. The landing was perfect apart from the fact I did it all 4 foot above the ground, great approach, fair speed and nice flair, stopped then found I was still 4 foot above the ground - thump ! It's surprisingly difficult to tell how high above the ground you are by just staring down at it - Mike tells me I'd do better looking at the horizon instead. Oh well next time. 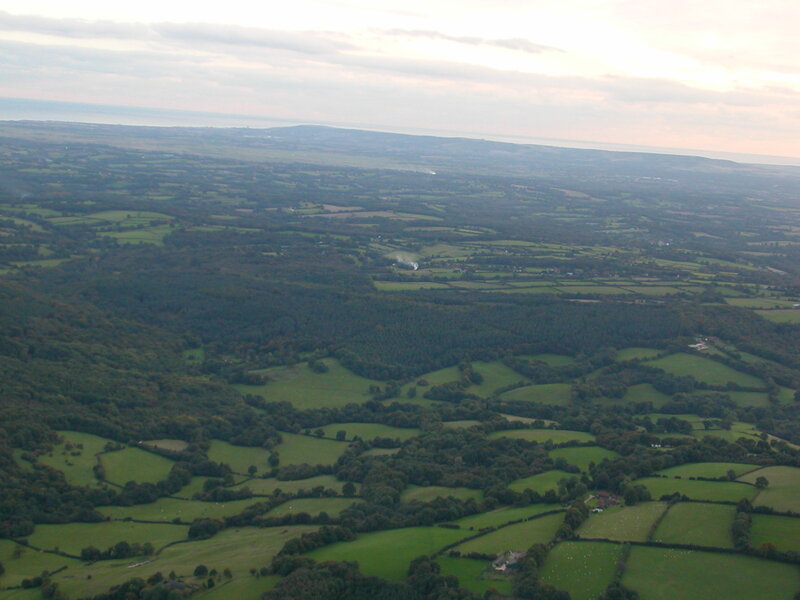 One of my tasks to pass the course is to fly 10km and back by map reading and compass etc. 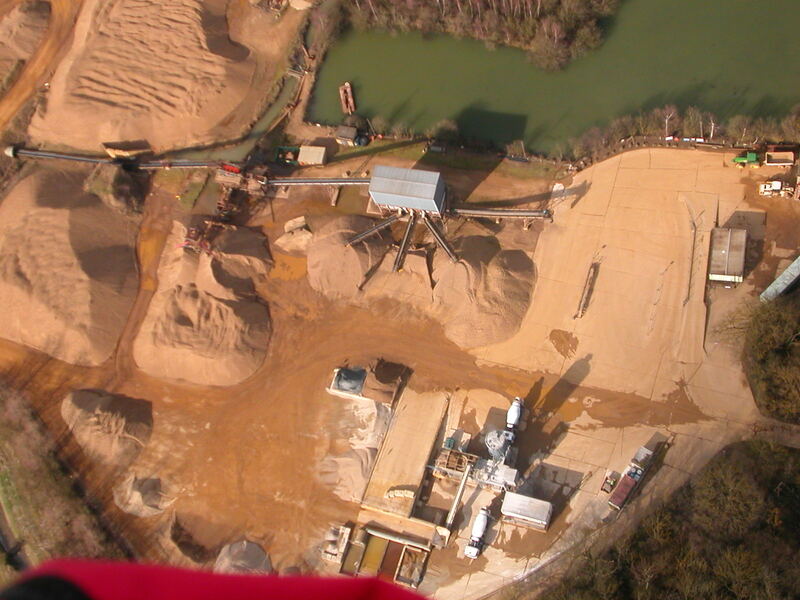 I flew to a small quarry and had a great time. This was a very relaxing flight. I had to do a 30 km cross country trip taking into account wind etc. My aim was to take 40 min to do the whole thing however the little crosses on the map that I was going to navigate by turned out not to be churches but small crosses on the ground (invisble from 500 feet). I change my plan to use the roads and rivers to navigate by. I'm having a fantastic time just floating allong - I've set the throttle so I don't have to touch it and I'm stearing by weight shift alone which means I don't have to hold onto anything. I eat a few sandwhiches and take photos. In the distance I can see the glint of the river and head towards it but on getting there it turns out to be small connected lakes. 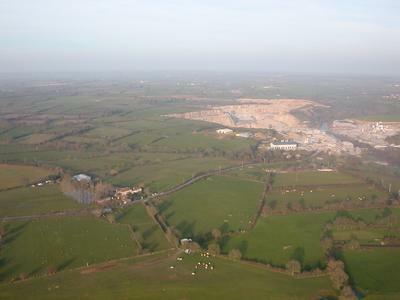 I then discover a huge quarry and find its not on my map at all. I think I'm lost. I try flying back the way I came but everywhere looks the same. I'm definitely lost and I've been gone for 1.5 hours - so much for planning. I concider landing next to a lovely looking caf� and calling mike by phone but seeing as I still have fuel left I continue on. I end up finding a road sign on an empty road and just float down next to it so I can read it and work out where the hell I am. I'm pretty sure I'm heading in the right direction now but it's into the wind and progress is dreadfully slow and the higher I go the slower it gets, it's a shame the wing is so slow (no trims etc) but I guess its safer for beginners like me. Being slightly closer to the ground allows me make more headway into the wind and it seems more reassuring but it gives you very few options if the engine does quit. My new route means I have to clear some tall power lines and I find the progress drops to a crawl (2mph) when I fly at a comfortable height above them. I finally land next to Mike having been gone for well over two hours and he gives me that "well where have you been look" - I smile and tell him I've just been sight seeing. Must say the that trip was fantastic - an out of this world type of thing - a bit like scuba diving or parachuting but lasting far longer. This first trip will definitely be one to tell the grandchildren. 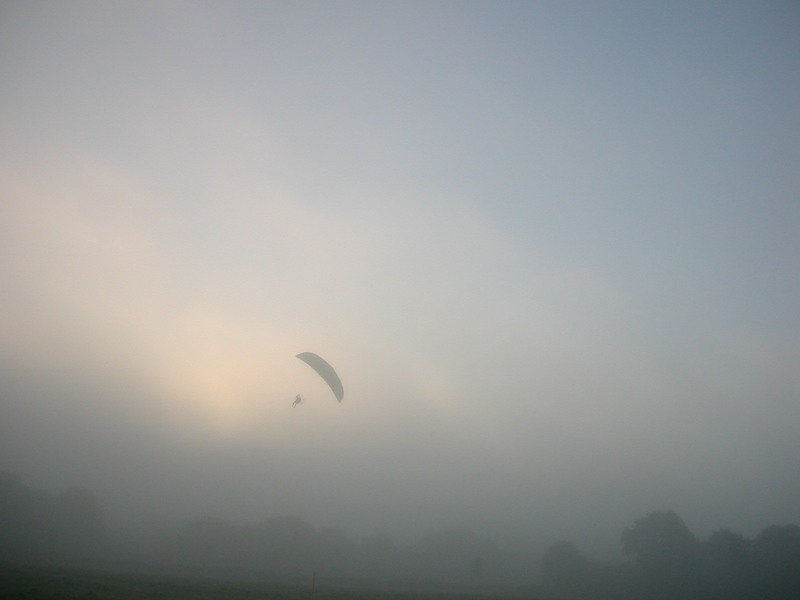 We go to fly at a french paramotor meet and I feel quite excited about flying away from the school environment. 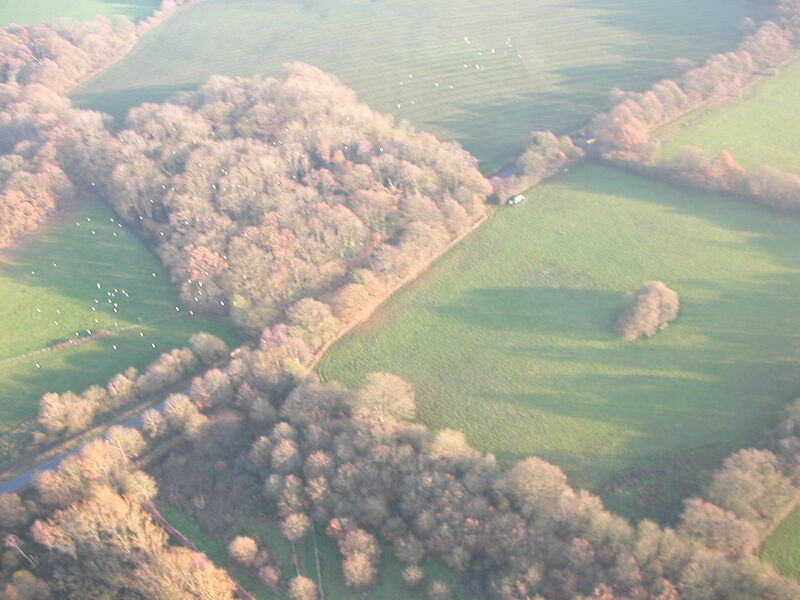 But when we arrive the field seems tiny and it's surrounded by tall trees - oh dear. A french guy was taking off just as we arrive and it made me feel better to see one of the worst takeoffs ever - I think at least my take off will be better than that. Sadly it wasn't. I manage to get off the ground fine but climb into the seat way to earlly and manage to upset the wing big time. One moment I think I'm going to hit the trees on the side - I swing to the left - now it looks like I'm 20' too low to clear the trees at the end of the field - oh dear! - I squeeze between two of the trees practically kicking the branches out the way but I make it into clear sky. Why do you do your worst take of ever just when there's an audience ?? Rest of the flight is fine and I even manage to land just where I want. I figured I was going to have to listen to a few lectures from Mike. Oh well. 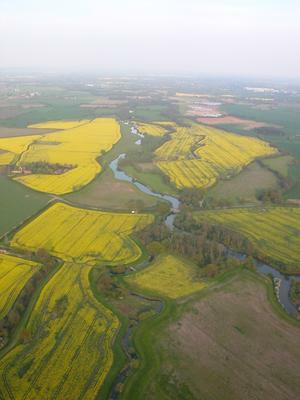 March 2005: In retrospect I think the field was fine and very similar to the types of field I now use back in England. I think it was just that I was so used to taking off from huge fields with no obsticles of any kind that a normal field seemed tiny. Today I'm out flying with Mike Cambel Jones, I guess the other Mike was going to pass me and then had second thoughts after seeing my take off yesterday (can't blame him) so now the other Mike is going to give a second opinion. He also wanted me to fly my wing which I haven't flown yet - I can sense things going horribly wrong, a new instructor, new wing and all the stress of trying passing a course. It turns out the new wing is fantastic. I managed to do everything with no problems. My only small issue was doing a low level fly past at 2 feet rather than 20 feet - the radios can be difficult to make words out - great fun though. I passed - I can fly ! He suggested to steer using inward pulls onto my lap which might stop over steering/braking. I now have to try my own motor and run it in. I had a hell of a time trying to start it (it turned out that I just needed to prime it). Everything I tried failed - it sounded very solid but just wouldn't fire. It turned out it just needed priming but to be honest I wasn't expecting it to fire so when it did kick into life it was inside my garage with the doors closed - it was like a small huricane in a very confined space - I was overjoyed to hear it start but had to turn it off as, even on idle, it was begining to remove items of the shelves. Outside the garage things went better but there was no way I could hold the engine still (and safely) at full throttle. I put markings on the fuel tank to show how many litres are left. I also try hanging it from the rafters in the garage and try sitting in it - its very comfortable. I met up with a few guys I met on the internet who fly in Kent - Pete Searll and the lemmings where everyone was great and very encouraging. I'm glad as I didn't fancy flying by myself. I had my first flight with my own motor. I took off first because I wanted someone to watch me take off and scream if I do something stupid. It's a reverse take off, which I prefer, and I'm in the air in a couple of feet. I'm up ! 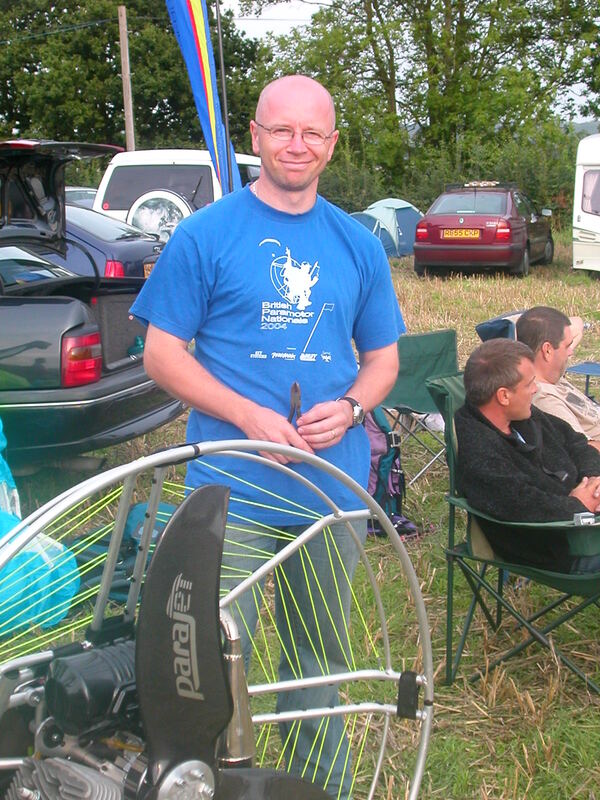 With my own kit and having a great time (apart from getting into some rotor of a near by wood). It seems to use 3-4 ltrs/hour which wasn't bad (I can theoretically stay up for nearlly 3 hours). The whole thing feels very comfortable and well built and the take off seems almost instant. This was all on on neutral trim - I didn't feel brave enough to play with the trims on the wing yet. I need to adjust the lines as they're set for lower hang points and so I can barely reach the lines. Also the motor seems to fly to the right all the time and I need constant left brake to keep it straight which was annoying and weight shift seemed almost impossible. I hang the motor up at home and readjusted all the straps to make it fly a little straighter - hopefull I haven't made it worse. Strangely one of the things I really liked about the motor when I saw it was the throttle control which has a low fuel light and a cruise control button rather than a screw to tighten up in flight. However when flying the wing I found the throttle doesn't cruise at the pace you want it to cruise so I'll need to do something there. Wear flight suit every time - it was very warm on the ground but after 1 hour I was frozen. 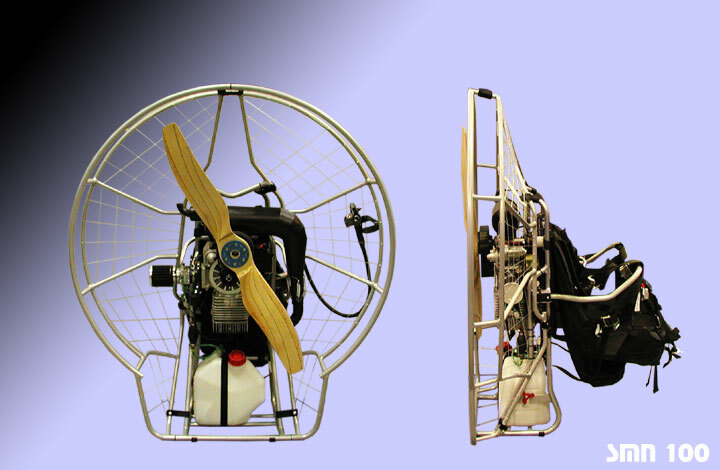 Fly higher - it gives you more options in case of engine out (but colder to). Wear ear plugs - it must help in long run. Mix petrol and oil in container then add to tank - as I added fresh petrol to tank and found couldn't add whole 5ltr so it was difficult to judge oil ratio. I've just bought a new flight suit but it�s a lovely warm day and I decided to leave it behind. I'm flying with Pete and Terry and we have no particular route in mind and we just decide to see where we end up. There's no wind so it�s a forward launch which I never liked during training but everything goes fine ( movie 2mb of us taking off). The good news is my adjustments to the harness make the unit fly straight as a die but I've done something stupid with the seat and I'm being squashed as I fly - it won't be too bad as long as we don't fly for too long. Problem is I'm also finding it very cold and after 30 min I'm beginning to shiver - I should definitely of put on the suit. We end up flying for nearlly 3 hours - I'm practically crying from the pain and having to do warm up exercises to keep warm. If I was sensible I would have landed but I'm still very wary of landing in places I don't know and I keep thinking they can't fly for much longer. We fly past lots of hot air balloons and everyone waves - I guess my warm up execises look pretty much like waving, we also fly beside Bewl water which is very pretty. I keep thinking Terry's going to land whenever he swoops down on something but he allways seems to shoot back up into the air. I try getting out the seat and hanging from the harness - this helps to relieve the pain in my back but hanging by your knackers at 1000 feet isn't entirely comfortable either. I also try flying lower just to keep warm but I know it's not safe - the higher you are the safer you are and I'm sure in places I was way too low. At some point after 2 and half hours my fuel light starts to flash and after another 20 min its shining permanantly. I use my mirror to check how much is left and can't see anything left at all. Oh well - I guess I'm going to land out for the first time. 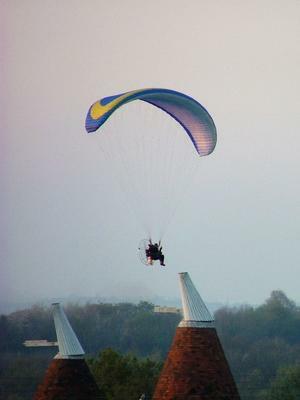 Suddenly Terry swoops down infront of an Oast House (these are Kent farms that harvests hops for brewing). I'm actually past caring now and not entirely sure I can get out the seat to land. 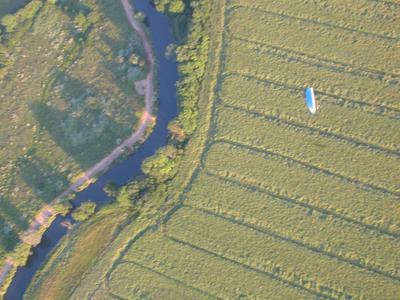 I line up between the trees and aim for a patch of grass between Terry and Pete's gliders. Everythings seems fine until I noticed a feignt line between the trees, I think for a moment its just a hair accross my sunglasses but then realise it's a power line - thankfully I hadn't turned the motor off yet and just manage to gas it enough to clear the lines. I'm totally distracted now and land on the grass like a sack of potatoes. I look back at the fuel tank - there's no fuel left at all. The Oast house turns out to be Terries home and his wife comes out to meet us. It was a beautifull flight but I'm never going up without a flight suit again. The trimmers were very easy to adjust but using full speed did increase the fuel usage. I'm going to spend an hour or two hanging from the rafters in the garage and get this harness right. I think the flight was the longest flight any of us had been on (and the other guys had been flying for a few years now) I just wanted to drink large cups of tea to warm up. It was fantastic though. keep hands on brakes in thermals to keep wing pressured - safer. Another sunny day and we tour round the sites to decide where to take off from. Maybe its my inexperience but I'd of been happy with any of the launch sites. We end up in a field and sit down looking up at the fluffy white clouds and cooled occasionally by the sudden gusts of wind. Two of the guys decide not to fly, they say it's far to thermal??? I look up and think I only get the occasional chance to get up and seeing as it isn't hailing then I'm happy. Terry also thinks its fine (actually Terry allways thinks its fine even if it is hailing) and we decide to go up. I'm setting up my wing while he takes of behind me and the other guys lay back and enjoy the weather. I hear his engine warm up, take off, climb and then suddenly cut out. I turn to look for him but the skies empty. 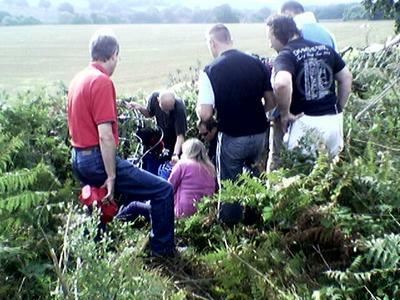 It seems his engine quit just as he cleared the field and he landed in a small field just past a copse of trees. After he returns I take off myself - everything seems fine when suddenly I seem to hit a load of sink (pretty much where Terry went down). I gas the engine and seem to maintain level flight and then suddenly get yanked into the sky - from 500 feet to just over 2000 in what seemed like moments. My first proper thermal ! I try going round in circles under the clouds but it seems entirely random as to where I find lift or sink. It's also very rough in the air - I normally let go of the controls and take photos etc - this time I'm holding on like grim death. It's not scarry as such but it's not relaxing either and the guys are all laying in the grass probably thinking its better being on the ground. At one point a cessna flies past at about shoulder height from behind. I decide to land and, to avoid being surprised by any random sink etc, I keep the speed high. Problem is trying to land on a down hill slope is difficult - everytime my feet get close to touching down and I use the brakes I simply lift of again. I decide to get my feet down first and just run it off. I end up running across half the field and have to jump over a wing at the side of the field. I guess I forgot to brake at all ! I realise I didn't think about the harness at all - so that's sorted now. I think I ought to use ear plugs in future. Pete showed a new method of priming the carb but I need to understand it a bit better before using it. The idea is to gently poke a small hole in the back of the carb (it opens the diaphram) while squeezing the priming bulb. This then drips petrol through the carb. This should be done with the engine at an angle so the excess fuel seeps towards the filter rather than flooding the engine. 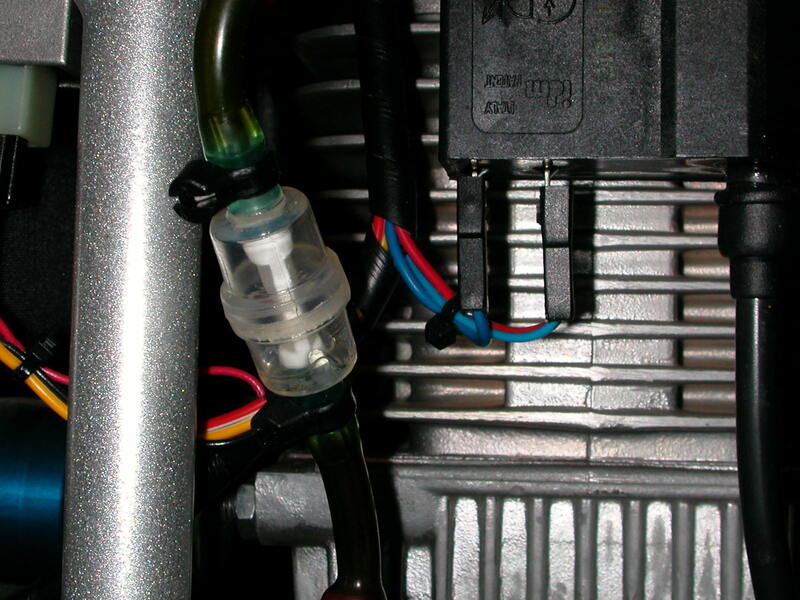 It's a good idea to tie a tie-clip somewhere near the back of the carb for doing the poking. It was also pointed out that I ought to relax the power immediately after take off just to avoid any chance of stalling the wing and no turning. We take of from an air field this time - literally off the runway which was quite ammusing. The aim was for all 5 of us to fly past the camera and take of gracefully into the clouds. I of course get 3 failed attempts in a row and the camera man decides its not worth waiting for me ! It's ammazing how hot you get in a flight suit in the middle of summer carrying 30Kg on your back and trying to pull a large kite into the air. It seemed I was reving the motor too soon and this was affecting the wing and causing it to tuck. I guess I was getting lazier and lazier as time wore on. I might also try to put the trims at 1/3 slow which I'm told is better than 1/2 way. 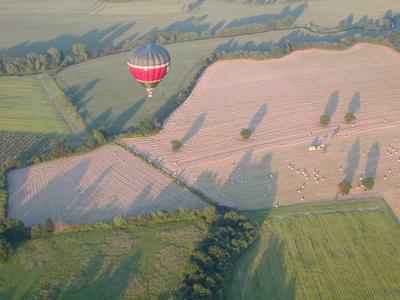 My last attempt was fine and up I go to play with the hot air balloons again and also, because it�s a late evening flight, the shadows on the ground are fantastic. I think for a while that I've lost full power until I remember I'm wearing ear plugs! Almost immediately after take off I get into a big oscillation ( the movie 1mb ) which felt odd in the air but looked quite disturbing from the ground. I'm not sure whether its me trying to get into the saddle and then over correcting on the brakes to make things worse (PIO=pilot induced oscillation ). I'm told its better to raise the brakes and just hold the risers to avoid adding any input to the wing and let it sort itself out. I try out my new GPS toy and find the wing flies at 24mph. I should really of tried getting speeds for all settings of trim and flying in both directions but maybe next time. I'll also have to sort out a flight bag etc that can carry all the gear and a map. I think I ought to lengthen the lines a few more inches as well. I've ordered a ground handling harness to practise take offs etc on the common. At the moment I'm just not flying as much as I'd like and I also need to be able to improve my forward launches and improve my ability to walk with the wing inflated above me. I've tried doing this with the paramotor harness but it's just too much like hard work and it puts a lot of risk on the frame if it all goes wrong. The only problems I forsee are being recognised as the fool with the HUGE kite, getting attacked by dogs or actually taking off on the common. I guess I'm going to have to adapt the brakes as the ground harness definitely has low hang points as opposed to high on the paramotor. We had about 30 fliers at the lemmings paramotor meet up. We established a few rules like fly away from the take off site, no tricks and stay above 500 ft. Needless to say, within 30 minutes, we had fliers doing spiral dives onto the campsite and pulling out at about 6 foot above the ground! 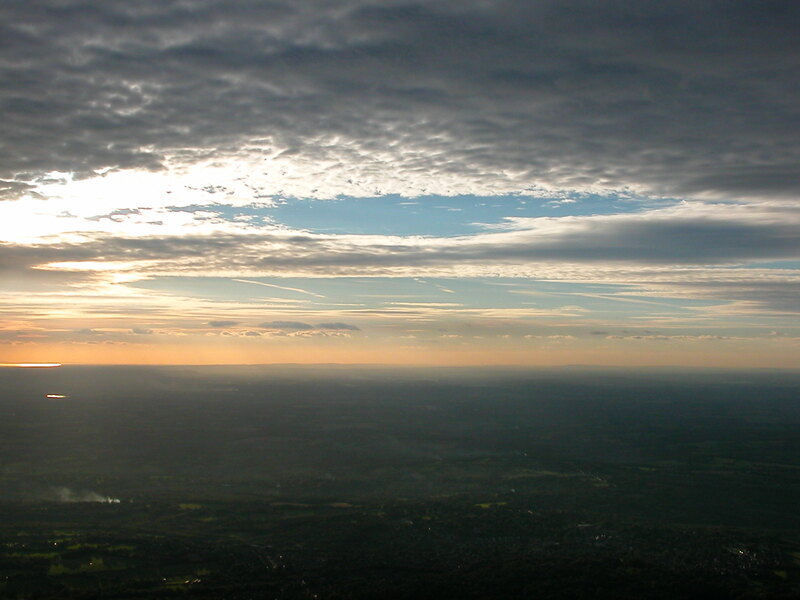 I took this photo at 7:15am on Sunday morning with Julias using his better eyesite to stay within VFR :). I met Paul Bailey of Bailey aviation, Martin from ParamotorsUK who helped me out with all the engine issues and Michel who, I believe, organises the British team. I didn't want to fly as much as I thought I would. Not sure why this was but the ariel arobatics, TV cameras filming and the ground littered with broken propellors caused by take offs in changing winds made you want to just sit and watch. The two flights I did have went fine so I was happy with that. Michelle actually dissappeared off on Saturday afternoon to kite surf accross the English channell and back but was back again for the evening meal ! Drove to the show by motorbike - must admit it seems a long way from London and it was cold and wet. My main aim was to see Murray's NWXBRL launch and I had to sit through 2 hours of talks before the demo and then the demo failed - maybe it's possible on a scotish hillside but definitely not in Telford. It was nice to meet everyone again but I just felt tired after the run up there and I really didn't need anything. I eneded up buying a hat, a dvd on ground handling and an RC plane ! It was only when getting the plane to my hotel room did I think it might be difficult to get the huge box on the bike. Had a meal with with Pascal and his mother, Andrew and Julias. It turned out Andrew and Julias didn't have anywhere to stay so I offered them the floor in the hotel room - luckily I think they found a better alternative. A week later I heard that Andrew had bust his back and Julias had his legs damaged when their landrover rolled away with them balanced on a ladder on top of it. Get well soon. Had a call from Pete to say everyone might go flying on Thursday - sounded like a fine idea as it had been months since I last went. I did notice that all the prop bolts were loose - very loose - so I'll need to tripple check that in future. Also managed to start the motor using the carb probe method rather than twirling the prop round by hand while putting my hand over the intake - I'm 100% sure this is the safer way of doing things. It was December but not as cold as you'd think so I just wore the flying suit and not the thermal stuff, never the less after three failed forward launches I had steam comming out my ears. I decided to cool off and have a relaxing cup of coffee. Next launch went fine and I had a lovely flight. I remembered to check the speed of the wing (on fast trim) using the gps unit - it went from 35mph to 15mph depending on wind direction. I guess that makes the fast trim speed to be 25mph - that also makes the wind speed to be 10mph at 900' while it's around 2mph on the ground. The temp on the watch said 6C at 1000ft which seemed quite pleasant to me though everyone else thought it cold - I think the fact I wear a helmit keeps my head warm and the gloves combined with a plastic throttle keep the hands fine (the metal ones chill your hands). 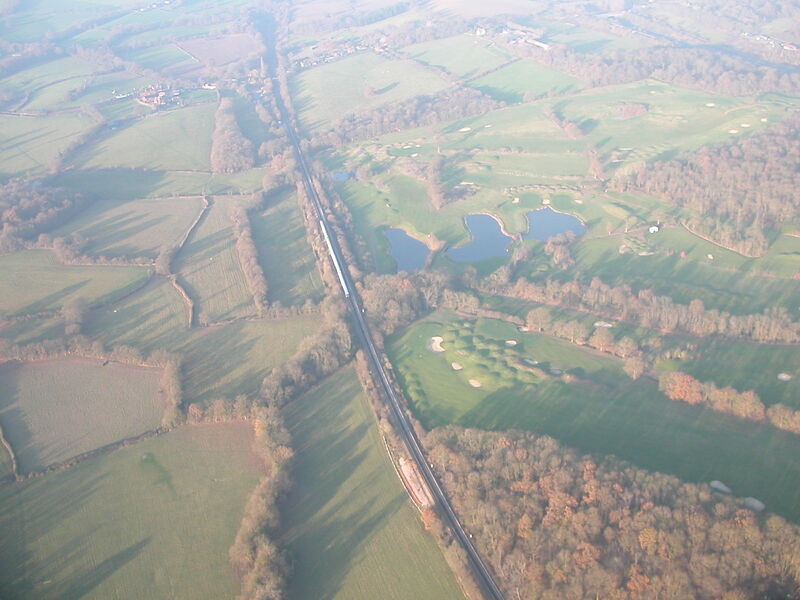 I flew past the golf club, followed a few trains and flew around bewl water. Had a flock of birds fly past beneath me which was sweet but they fly much faster so that dream of flying allong with a flock isn't going to happen unless they're really lazy. Oddly I forgot to change the trim to medium for landing and rather than landing at the mad run I would expect or like a baby elephant falling from a tree (my normal style) I just braked it off as I landed and landed gently on my feet with the wing just staying in the air above me. I even thought about just taking off again but thought I'd be pushing my luck. I also tried attaching all my flight gear - camera, altimeter watch and gps onto the same cord from my jacket which makes it much easier to keep everything organised - it would be even better if I could ensure they stayed flat and open on my lap so I could read them. We visited my brothers family in Spain this christmas. As a pressy I was given a lesson on a microlight. Of course because I already flew this meant I had to experience what these machine were capable of - I can testify they handle stalls very well and can pull a good few g in spiral dives to the ground! I even had a go at thermaling them allong ridges - this was very "exciting" as you need to be much closer to the ground (<200ft) and of course a motor out means a mountain landing. They were very good machines to fly and much faster than PPG but also much more expensive. 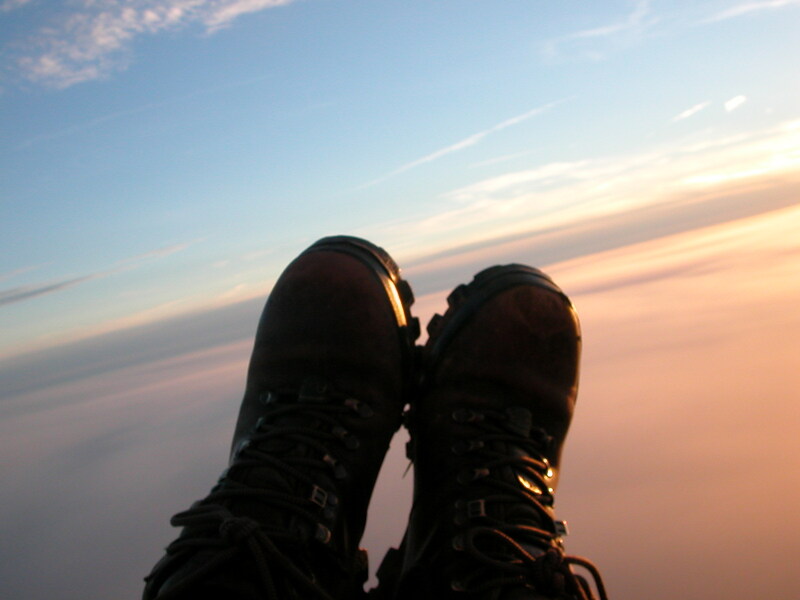 I also think I prefer just sitting in a small chair floating through the clouds - it seems more excentric, I also like the slow speeds as well - it seems to encourage you to have picnics in the sky, not so good for actually getting anywhere though. 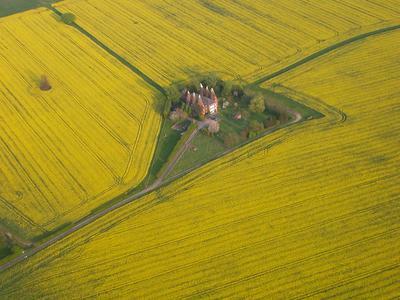 Pete's moved into his new house and has declared the field out back to be Londons new aerodrome ! There are a few neighbours about so we'll have to be very quiet on the warm ups - ie no full revs testing on the ground. There are a few learners there so I help out giving a few ground handling lessons - other peoples mistakes allways appear so easy to correct but I can never work out my own. My first issue comes about when the starter button doesn't work - it turns out I was using the stop button to try and start it - how long was it since I last flew ?? Of course it fires into life when I use the right button ! I got bored weighting for everyone else to get ready and decide to take off first (never a good idea). A text book reverse launch (even caught on video!) and I head off into the wind trying to climb out before I hit the first set off trees and their accompanying rotor. I suddenly lose power and decide to head across the field to a more open area. I'm pumping the throttle and the power comes back so I fly allong trying to keep the options open while pumping away - after a minute I get full power back. I figured it might of been air in the fuel lines which would normally be drained by the full power test on the ground and decided to head on with my flight - a big circle of the surrounding country side and including buel water. 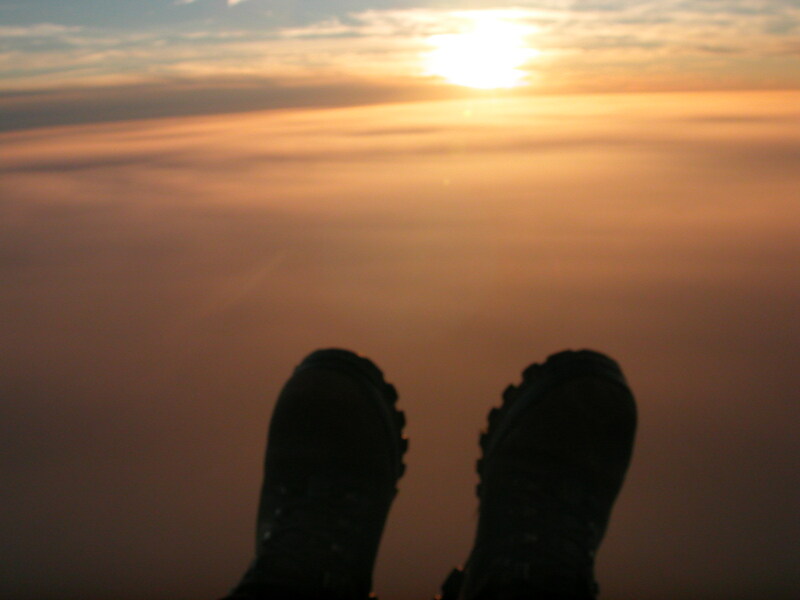 I tried to fly above the clouds but it became quiet hazy at around 3000' (an inversion layer I believe). I gave up at around 3300 when a plane flew past underneath me, I'd recently learnt that planes will waggle their wings when they see you but either this one hadn't seen me or he'd waggled when I wasn't watching - so I flew down into clearer skies below. I decided to check my fuel level (I'd put in around 7 litres) but on pulling out my mirror I find the lanyard (string) attached to it had come off so now I had to tie the string to make sure it didn't get caught in the prop. I seemed to have plenty of fuel left. I'd been flying for an hour and I was begining to get cold, my guess it was around -5 C and I was only wearing a T shirt under my flight suit. Strangely it wasn't my body that was cold but my hands and the small part of my leg which was showing between my boots and my suit (I should wear longer socks). I started thinking about heading back to Pete's and set a heading on the GPS (at this point I get a warning that the batteries are low). At 3000' fiddling around with menus etc with frozen fingers isn't pleasant especially when I concider how poor I am at map reading (I must improve this). As I approached Pete's I could see the gliders laid out on the ground and some of the guys practising reverse launches on the hill. I did a big circle to loose height and line up for the landing between the power lines and other assorted obsticles which they haven't had time to clear yet. Everything looked fine, I'm out the seat with my thumb on the stop switch, when I see another barbed wire fence and realise I'm landing in the wrong field - I give a blast of throttle and cruise over the fence then kill the engine to land. I guess I'm still swing about under the wing due to the late blast of power and end up doing a face plant in the mud. Luckily it didn't hurt, even luckier it wasn't videoed as a convenient bush hid everything (thanks god!). I'd changed my spark plug to a very expensive iradium one and I'm hoping it will cure that power loss problem I had shortly after take off last time. Of course it doesn't. The engine cuts out again at full revs but at least this time I'm warming it up on the ground. Luckily Pete was on hand and just idly twiddled a screw on the carberetor and everything was fixed! It showed me a number of things: that you have to monitor the engine and adjust the settings, that Pete knows a great deal about engines and finally that I know absoloutly nothing about them. It was quite a strong wind today (bordering on too strong for paramotoring) so I left the wing trims on fast and laid the wing out for a reverse takeoff. The wing was up in a shot and I just turned and applied the power - I think I was airborne as I turned ! It was only when I was up that I noticed one of the lines was routed wrong - I was pretty sure it wasn't worth worrying about but it did suggest I should tighten up my preflight checks. There seemed to be a big inversion at 2000 feet. The air higher up is quite warm and the cold air that warms up on the ground rises up until it hits this layer of warmer air. You end up with a layer of dust, mist etc that has risen up from the ground and is quite difficult to fly through and rise above. The layer wasn't particularly thick and it was quite easy to see ground detail (houses, roads, cars etc) through it so I believe I was still flying within VFR (Visual Flight Rules). Above the inversion the air was crystal clear, there were a few small clouds at perhaps 10K feet but other than that it was just blue skies - no birds and no planes - it seemed like I was in an advert for some posh airline or perhaps some slimmers crackers. Another thing I learnt today was to be carefull of flying at certain altitudes ie 1500, 2000 or 2500 feet as these are very popular with micro lights - so I guess fly at 1750 or 2250 etc just to ensure you keep clear. We'd been flying for a while when Pete drops down into a field and lands - I don't fly with a radio so I'm circling overhead wondering what the problem is - a motor problem, ran out of fuel ? I've never had to land out and I'm very wary of landing somewhere new - as I get lower I'm checking for barbed wire and telephone poles etc but it seems like a pretty easy landing. Obviously there isn't a windsock telling you which way the wind is blowing but, seeing as I was getting 55mph on my GPS in one direction and 9mph in the other, it wasn't difficult to guess from which direction it was coming ! It turned out he'd decided we weren't going to make it back to his place before sundown and he'd simply chosen a pleasant place to stop. It was a great flight and we were even picked up by Pete's wife - thanks Liz! Ages since I last flew and of course it's a forward launch (hate them) - 3rd time lucky! 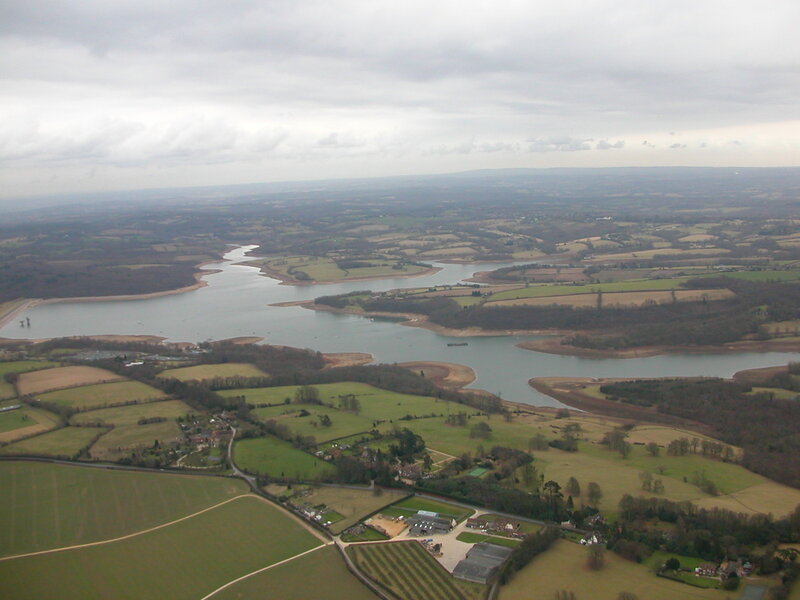 Our plan was to fly to Bewl Water and from there head to the coast. This my first trip to actually go somewhere as opposed to circling about and I was definitely up for it. Problem was I had 7ltrs of fuel from the last trip so I and didn't want to chuck the fuel away for nothing just to be able to acurately measure a new fuel oil mix. Anyway it was about 15-20miles away and it should be ok.
At Bewl water I waited for everyone but it seemed to take a while for people to arrive. I don't have a radio and I'm crap at map reading so, once Pete arrived, I turned south and headed off to the sea. I was expecting him to overtake and show me where to go but he seemed happy flying behind - I guess it's easier for him to moderate his speed to mine as well. There was a lot in the sky of kent that day - motorised hang gliders, micro lights and small planes, a large jet passed overhead on it's way to Gatwick, a couple of hot air balloons with one guy sitting on a stool with a gas tank attached to his back and a small hot air balloon holding him up - it looked great. I was so busy looking all around me for conflicting traffic that I missed 2 helicopters fly past underneath me but they were flying very low (one was a large Chinook!). It was a bit like playing aeroplane top trumps but with real aircraft. I could see the sea about a mile away but I was down to just 2.5 litres of fuel left. I dearly wanted to fly over the beach before returning but I figured I was going to run out of fuel if I tried it. 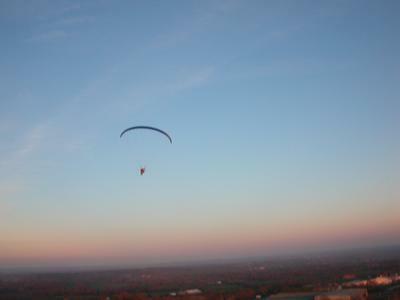 I was flying at 14mph into the wind (normally it flies at around 25mph) so that means the wind speed is about 9mph. Going home the wind would be with me so 25 + 9 = 34mph. My GPS said I was about 20 miles from Petes place so that would be roughly 40min flying time. I burn between 3 and 4 litres an hour so I figured I had to turn. It doesn't sound difficult working all that out but when you're floating at 2000' trying to fly an admitidly small aircraft in a sky that seems to be full of aircraft and knowing that a simple slip up in the math could lead to a long walk home - trust me it's difficult. As it happens I landed back at Pete's with a teacup of fuel left (a bit too close). Just bought a map case for walkers and it looks like it might work well for paramotoring - it cost me �8 from Blacks and it will obviously hold a map, my gps, altidude watch, monocular (like half a pair of binoculars), camera and some sweats. I should perhaps get a small compass to fit inside. I was also looking at a reserve that Pete sells through the lemmings site and it looked like it may be worth concidering. 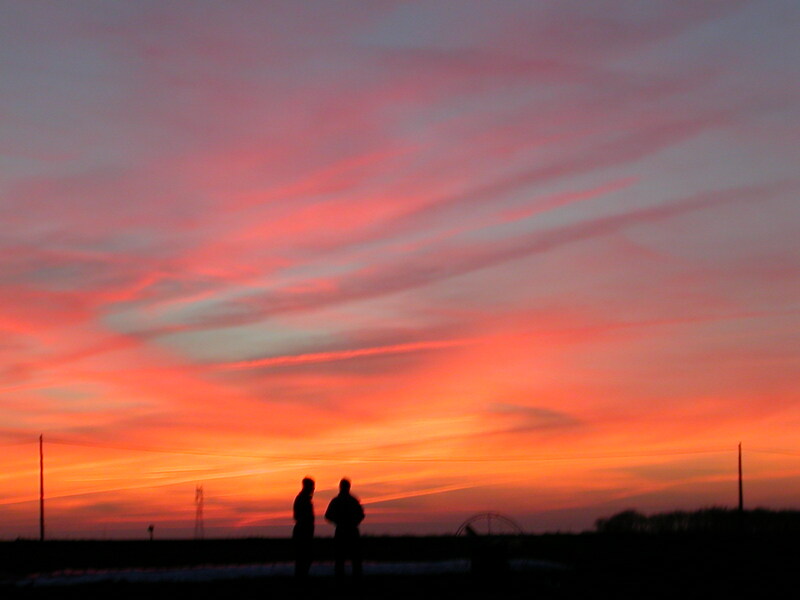 We�d been discussing the idea of doing a long cross country flight for some time. The idea would be to literally head in whatever direction the wind was blowing and then keep flying for as long as we can over a weekend. A good wind could allow you to travel up to 50mph and with perhaps 3 separate 3 hour flights per day then you should be able to reach Scotland in a weekend. It would be a great way of seeing the country and be quite an adventure. We were a bit divided on whether to take a support vehicle or not. Taking one would allow us to refuel quickly, do any retrieves in case of engine outs etc., it could carry our camping gear and give us access to fresh beer (and food) every night. 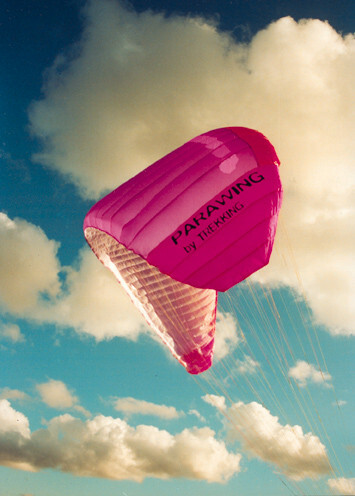 Perhaps more importantly it would allow us to get back (with our paramotors) at the end of the weekend. 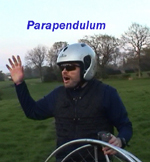 I guess finding someone to drive may present an issue but I�m sure someone learning to paramotor might volunteer, or we could take it in turns or perhaps we could just find a bloke who wants to escape his family for a weekends adventure. Not taking a vehicle would be more adventurous but would limit your trip drastically. You�d need to be very aware of where petrol stations are and land every time you saw one (one with a suitable field nearby). You�d probably end up following a motorway and stopping at each service station you saw which would be a bit dull. Of course if anyone has an engine out or just runs out of fuel then that�s the end of their adventure. Then at the end of the weekend you�d need to get back and what would happen if British rail won�t allow your motor on board? To me it seems like a good way of getting stressed, starved and stranded. I know some Spanish trap went for 400km across Spain with no support but every Spanish village can supply fuel and food and people are more relaxed about you landing on their village green. The two best directions would be north towards the Yorkshire Dales and Scotland or west past Salisbury Plain and on to Lands End but even an eastern route would still be an adventure out along the coast and/or the Thames, flying past Cantebury and on to somewhere near to Margate. The wind would need to be a steady 10-15 mph to give us the best distance to safety ratio. We could plan trips in advance and have them set up on peoples GPS units. Radios or mobiles would allow us to keep in touch with the vehicle. The vehicle could take care of getting more fuel, food and arranging a campsite at the end of the day. What type of vehicle depends on how many come but it would need to hold people, wings, motors and camping stuff. Perhaps a trailer might help or just use a Luton van and dump people in the back with a pack of cards or a jenga set. Everyone was camping over at Pete�s this weekend so I blew all the cobwebs off the machine and bought a new tent for the occasion. I�m quite taken with the tent � it�s a hammock tent that packs away into nothing and just needs hanging between two trees that are roughly 12� apart. I bought the tent on the Friday and was setting off on the Saturday so I thought I�d better test it out on the local park before using it for real the next day. I found out that the park keepers are not keen on people putting up tents in London parks! I made quite an entrance at Pete�s as the exhaust had blown on the car and the noise was deafening. Everyone was camping together at the top of the main field but of course there were no tree�s there, in fact it was much more difficult that you�d think to find two suitable trees the right distance apart, and I ended up strung between two gate posts at the bottom of the field. I tried practicing a little ground handling before we set off to the take off field. The wind was coming in over the trees and I was hoping that the mess I was making of it was due to rotor rather than just me forgetting everything. I couldn�t think of a suitable excuse for turning the wrong way on a reverse launch though! 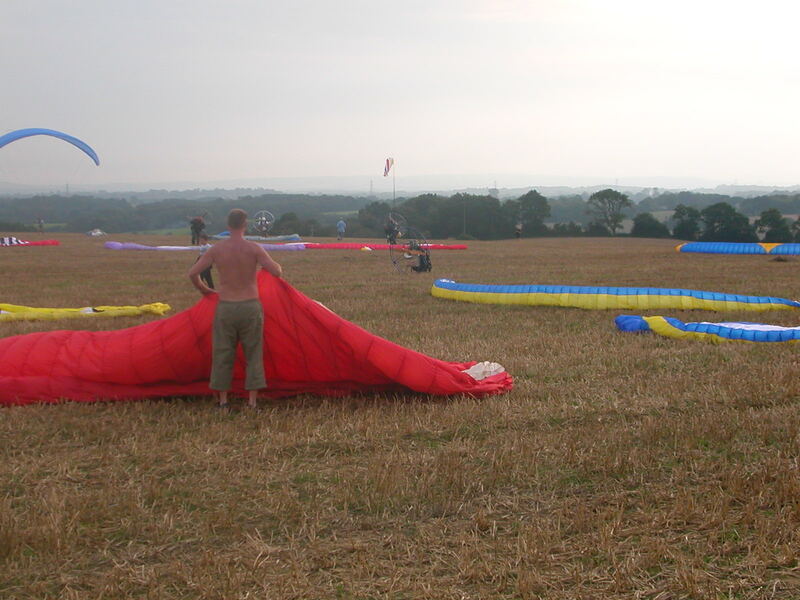 The takeoff field was great, it pointed straight into the wind and sloped down into the wind. I was pleased to find the motor started first time, it�s amazing how many motors out there that seem to have issues. I hooked up the wing and mad created a wall before glancing over at the crowd of people now watching from the picnic tables at the edge of the field. I must admit I never feel confident before a launch and, having not flown for 3 months, I didn�t feel even slightly confident but at least I do like reverse launches. I pulled up the wing, turned and gunned the engine and I seemed to be climbing away without even stepping forward! The only problem was I�d put the seat strap over the small seat adjustment strap which made the adjustment a little difficult. I carefully took off the strap and put things back again properly before going off to tour the area. Progress was quite slow into the wind but flying down the train tract down wind allowed me to keep up with a train. Today was the first day that paramotors can legally fly over towns (assuming we can easily glide clear in case of engine outs) so I found a little town and flew over it � must admit I find it much more interesting flying over countryside to suburbia. I flew over a large warehouse that had recently burnt down and peered down into the blackened interior. I also found a large hedge maze outside a nearby town and slowly flew over the top of it while trying to solve it � it looked quite difficult even from the air so lord knows what it was like trying to solve it on the ground. The thermals were out in action this afternoon but my high hang points mean I can almost ignore them even if they do occasionally spill my drink. The wind gradually died down in the late afternoon and the cloud cover increased until the thermals disappeared. After an hour or two or I returned back and tried to land close to our group at the top of the field but I just seemed to float past them and on down the field. I guess the wind traveling up the hill was providing a bit to much lift for me. Brian, from Scotland, was still practicing ground handling on the hill and I wandered over to offer pearls of wisdom. He looked knackered and frustrated but the wing was definitely beginning to play game. Pete decided he was ready and strapped him into the engine while I went down the hill to give him something to aim for. The wing went up, he turned fine and after a moment or two�s hesitation he was on full power heading towards me, another moment and he was flying � it�s great to watch people take off on their first flight. He did a wide circle round the field and landed next to the group at the top which was a damn site more accurate than I was � at least I ended up on my feet though! We could see a balloon taking off in the distance so we all raced to our machines to go and play with it. 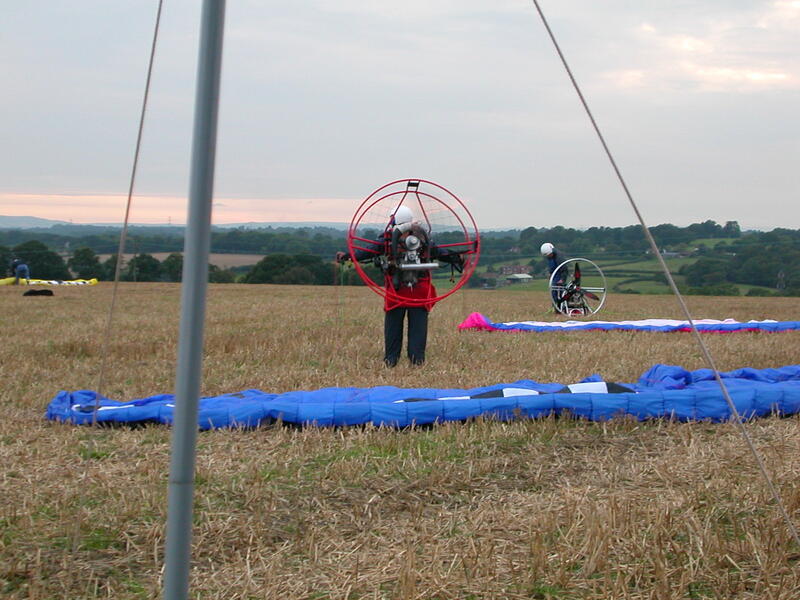 I�d say within two minutes we had 3 paramotors in the air heading towards the huge balloon. Immediately I left the ground I noticed that I�d twisted one of the risers (again) and that the brake line was caught between risers. I freed it and re-routed it so it didn�t rub and then let go of the brakes to get into my seat properly. 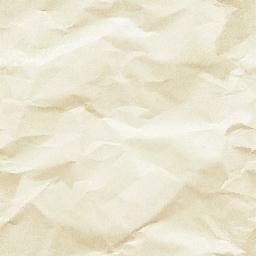 When I was sitting comfortably I reached up to the lines to adjust my course and found I couldn�t reach them anymore??? While looking around to see what had happened I realized I was leaning far further forwards than I normally could and discovered I hadn�t done up the chest straps and the arms were now flung out quite wide � it took quite a bit of strength to get the arms close enough together so I could close the catch. That was two mistakes in one flight and rather highlights the fact I need to improve my checks � I think I�ll get little cards with plastic wrap with all the checks on � one for wing checks, another for the motor, another just before I take off and a final one to pack things away. On a bright note my Suunto X-Lander watch worked well with altitude figures changing quickly and accurately with the height and it was very easy to read as well (the compass direction was wrong though so I�ll try recalibrating that tonight). My wing doesn�t fly as fast as the actions but it can easily out climb them so I was soon flying alongside the balloon which I followed for 30 min before heading back. I circled down to 200� and then aimed again to land next to the group. I ended up 50 meters away down the hill (at least this was better than last time!) Perhaps I should practice spot landings � i.e. come down close to a spot on the ground but then power away to try again but then it might be better to just chang my expectations and aim for the field rather than a spot within it. Back at the campsite, four of us carrying beer cans piled into an Austin Metro and headed for the local take away food joints � it made me feel as if I was 17 again. Arriving back at the campsite we found everyone chatting around the camp fire and lit by a full moon. It was a good end to the day. Interestingly the hammock tent worked rather well and I woke fresh as a daisy the next morning. 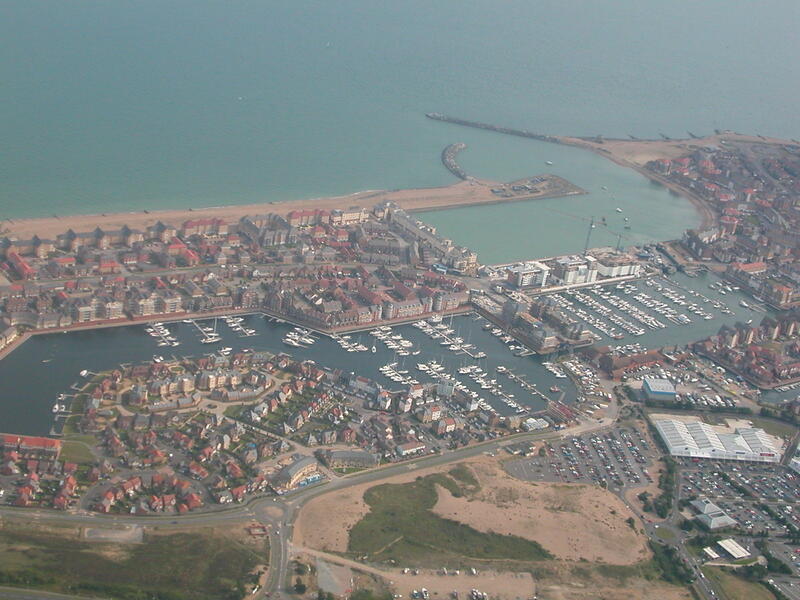 The guys were planning a trip down to Camber sands and along the coast which sounded fantastic but I felt I couldn�t go. My car wasn�t working at all now and I desperately needed lunch but didn�t have anything so I settled on a chocolate bar (I�m diabetic and need to eat at regular times) I thought it best if I just tried my best to get home rather than flying off into the blue yonder . 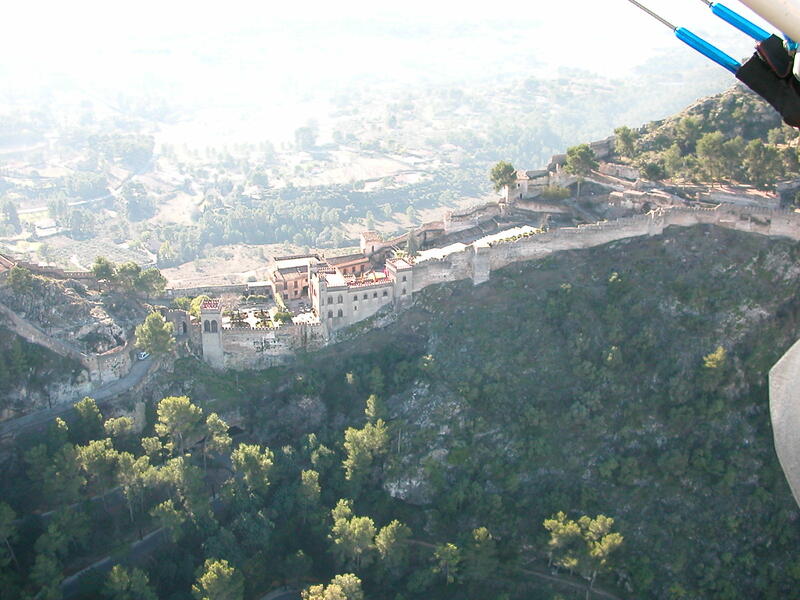 Perhaps we�ll do the flight again on 13 September at the lemmings do. Next time I come camping I�m going to bring all my food in advance rather than plan on getting it on the hoof. We�d only been in the field for 5 minutes when Terry hobbled over to us to show us his bottom. He�d had an emergency downwind landing and, as normal, decided to land without getting out the seat. I must admit as a general rule I don�t look at blokes bottoms but this was quite a sight. I suggested he fit wheels to his seat in future. After setting up the tent I went for my first flight. It was quite hot out on the field and there was barely any wind and, what little wind there was, was coming in from all directions. There was a large windsock in the middle of the field and I set up across from it and simply waited for a wind to come in from the direction I was pointing. 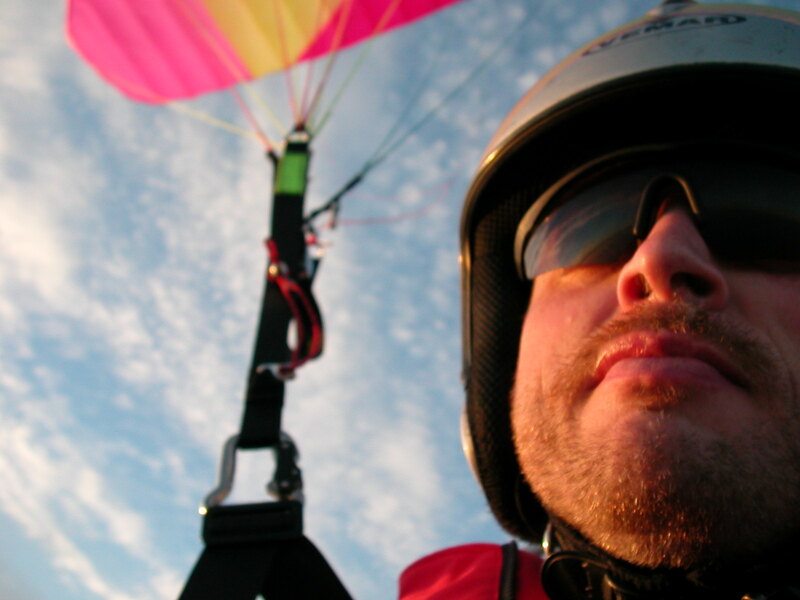 I didn�t have to wait long, I pulled the wing up above me and was about to set off when the wind changed again. I re-centered myself and applied full power. The only problem was I was now pointing straight at the windsock but it looked like I might just squeeze past. I kept on full power and soon my feet left the ground. 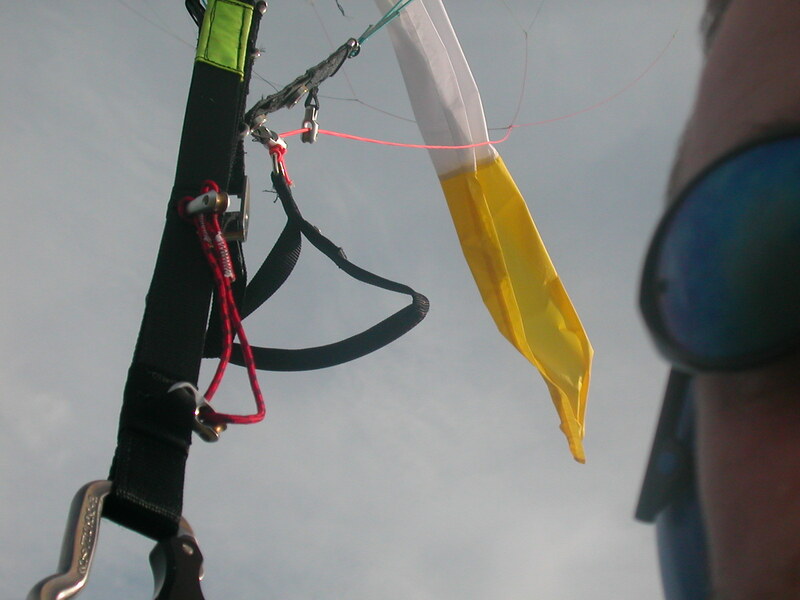 About half an hour into the flight I realized I�d taken the windsock with me and it was now attached to my lines and streaming out behind me in the wind. It didn�t seem to be moving about very much so after checking it a few times I decided to ignore it. It must be quite boring for windsocks to be stuck in a field while everything around them disappears up into the sky so I guess this one was feeling quite special. Because it was so warm on the ground and the fact that my forward launches are appalling I�d decided not to wear my flight suit � I figured I�d overheat by the 3rd attempt. Now, at 3000� and heading over the clouds towards to the coast I was feeling distinctly chilly. I was also flying with some new headphones I�d bought which seemed to work OK but I found it difficult to use the radio at the same time � this is probably my inexperience at using radios but I definitely found you need to adjust the motor to idle if you wanted to talk. 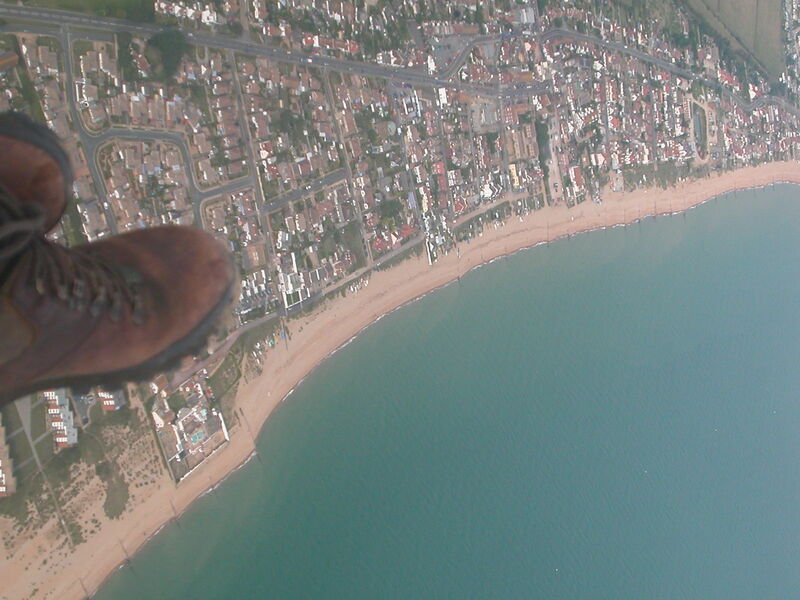 I flew to Eastbourne on the coast and then along the beach. It was great to finally make it to the sea but I wasn�t brave enough to head out over it. I did note a few campsites on the coast which we might try to use on some future weekend. The land is also very flat on the approach to the sea but I didn�t fancy doing any low flying just in case I caught the windsock in a hedge! Back at the campsite there were lots wings and motors all laid out in the field waiting to take off. It either meant a long walk back to the tent or trying to be as accurate as possible when landing. Luckily I landed ok. I found Jeffery, who owned the windsock, sitting in a deck chair laughing with a friend at how it was only Saturday afternoon and he�d already broken his prop and lost his windsock. He seemed very happy to get his windsock back. Back at the tent my kids seemed to have found a whole bunch of friends and my wife was finding it quite amusing watching all the take offs and landings. At times there was quite a �fresh breeze� in the tent as people either took off or landed only a few feet away from the tent. Then there was Julius and Michele doing acrobatics over the field, Julius even tried taking off with a 60� reel of tape attached to the back of his cage. It looked quite special as he flew up into the sky but he couldn�t resist spiraling down to the ground and trying to chase the end of the tape. There was a good party atmosphere across the whole field. Everybody was in a great mood, there was a Marquee with a good band , beer and BBQ. I even ended up chatting over a beer with the farmer who owned the land and I tried to tell him a little more about the sport. 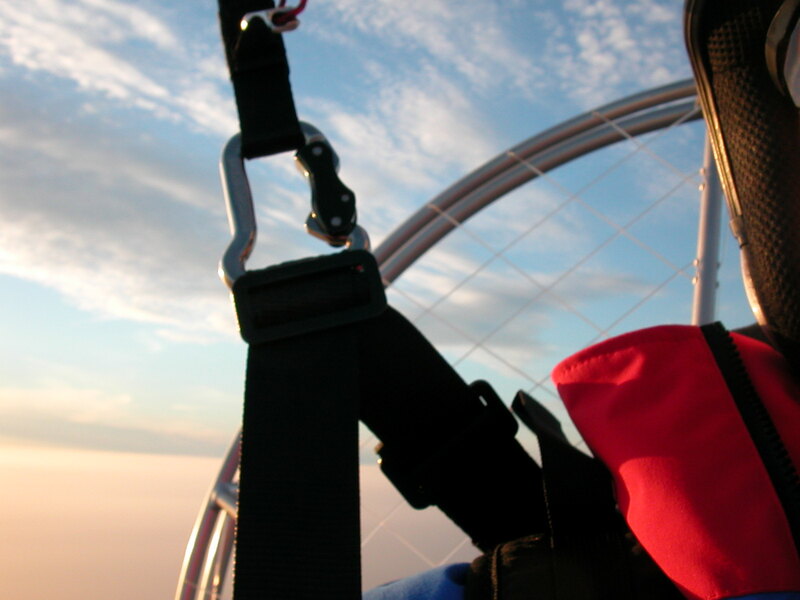 It turned out he flew paramotors as well and had been flying since 92. He was a very nice guy but then I think everyone I met was. There were probably at least 100 people there with people from France, Ireland, South Africa and Belgium. The Belgians were in an excellent party mood and I�ll apologize now for pulling the plug on the speaker system but at 2am I desperately needed to sleep. I was sorry to leave on Sunday and was surprised to find that the kids didn�t want to leave either. Where : To Camber ??? The question was whether we would fly or not. It was a 15mph wind and quite gusty at times which certainly suggested a no but it only took one of us to suggest the idea of flying and another to say �let�s see what it�s like in the field� and a moment later we were all in the top field laying out our wings. We decided to all fly to Camber but there is always the problem of getting a bunch of paramotors into the air at once, people want to go to the loo, others need to triple check every bolt, sometimes engines don�t start and then of course there�s the issue of actually getting into the air in very iffy conditions. I�m the one that checks every bolt as I use a check list and go through each item. A guy came across to ask about the check list and of course I end up chatting away saying how useful the list is. Of course I also forget where I am in the list and so forget to do all the checks in the last section (including my leg straps). Luckily I do yet another check just before pulling the wing up. I should write �do not talk to anyone while doing these checks� at the top of the list. My first launch was amusing as I didn�t center the wing before launching it and of course it shot up in a different direction to what I was expecting � this wouldn�t of been too much of a problem but in re-centering myself I managed to get the lines caught on my headphones so everything became quite messy quite quickly. My second launch was equally poor but at least in the right direction. This time the wing collapsed on one side but I kept going for it and everything seemed to sort itself out. 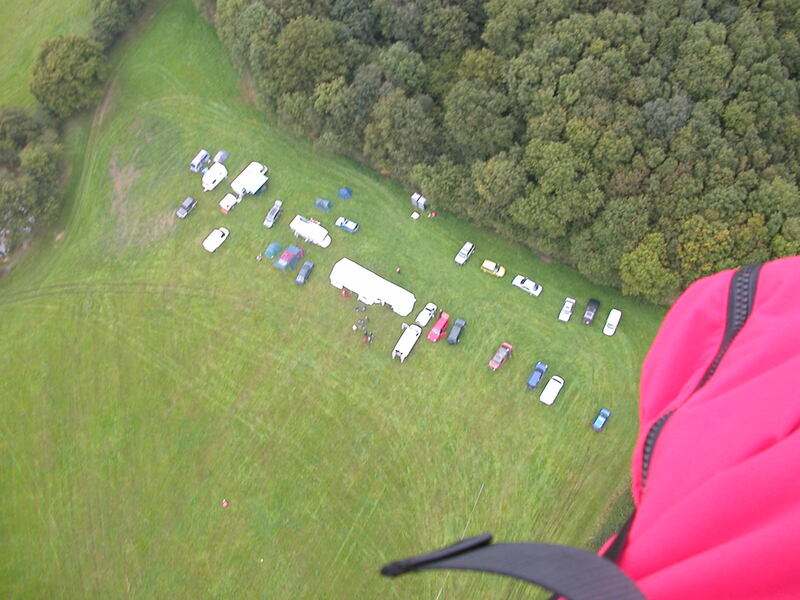 I managed to get airborne and headed off to Bewl Water to wait for everybody. Pete was already zooming around the countryside and I soon lost him in the half light. I tried to contact him on the radio but all I heard was �sdhfkbd sdfsdf sdf fss�. The radio worked fine with Dan on the ground but I just got garbage from everyone else. I believe we get a lot of interference from the engines and if the engines are on more than tick over then the voice gets scrambled. I pointed into the wind and was able to just sit in the same position at 2000� with no real effort at all. I waited for 30 min during which time my GPS batteries died � must admit I have no sense of where I am without the GPS and certainly had no idea where Camber was so I figured I could stay hovering over Bewel Water all evening or I could just head to the coast and hoped the others would overtake me on their faster wings and show me which way to go. It took no time at all to reach the coast and I tried the radio again �I�m approaching Beachy Head guys, do I go left or right?� � �asfdkh erfjkerfn efe freff�. I took a guess and instinctively turned the wrong way. In twisting around to try and spot the others I must of pulled the wiring out the radio and everything now went silent. I had to practically undress to get all the wiring and radio out from inside my suit and then rewire and everything on the outside of the suit. This took quite a lot of wriggling around but eventually I had everything back on line. However when I reconnected I found there was no-one on the radio - I think I must have flown out of range � this was probably because they were flying East to Camber and I was flying West to Brighton! 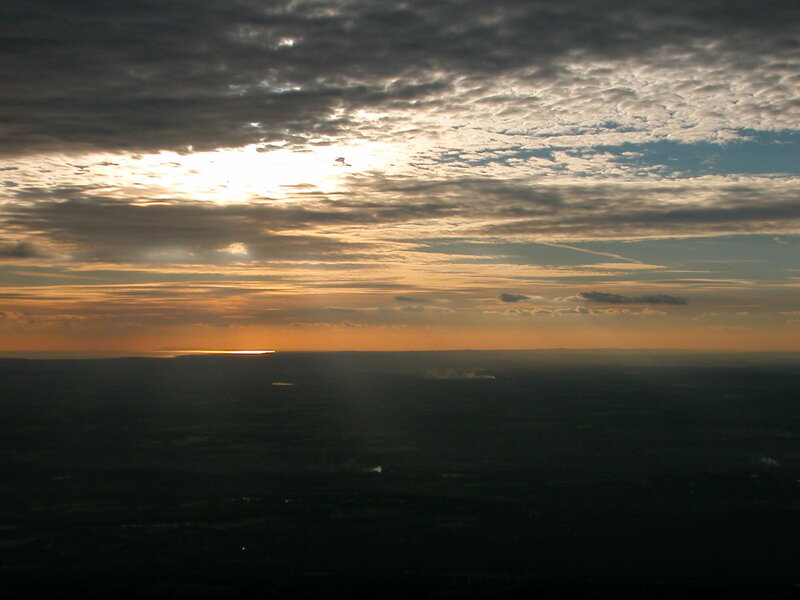 I flew for around an hour, taking photos of the clouds and just enjoying the views. Every now and then I would drop the revs and try the radio again but each time I heard nothing. While flying over Heathfield I tried the radio again and of course there was nothing, but this time the engine quit and wouldn�t restart! I couldn�t believe that this had happened as my set up seemed about as reliable as you could get. I tried to start the engine again, nothing doing. Oh dear. I was flying at around 2000� which gave me a fair amount of time before I need to touch down. To be fair you need to consider quite a lot as you come down. Which way is the wind blowing? You want to land into the wind so you need to find a field with an easy approach in that direction and preferably not too many obstructions upwind to cause turbulence. Next you want pick a field with a road alongside and preferably houses nearby where you can perhaps get a nice cup of tea while you wait. You don�t want any animals in the field otherwise the owners are going to be upset. Lastly (and quite importantly) you don�t want to find power lines in the field but these can be difficult to spot until you get to around 500� and by then you might not have the option of choosing another field. I choose what looked like the perfect field and did loads of S turns to loose height. When I looked like I was at about the right height to land right opposite the house, I came in to land. I floated straight past the house and was heading for the tall hedge at the end of the field � oh dear � it looked like it might be an unpleasant landing but luckily I managed to walk over the top of hedge and drop into the field next door. Why the engine quit � did I just hit a switch by accident? I found out what caused the problem - it was an electrical connection which was too tight and snapped. I'd been warned about this by a chap at the lemmings do. Either he was 100% correct or all his wiggling around of the wires to show me how tight they were fullfilled his own profecy! This should be easy to fix but I'll contact Fly Castelluccio to ensure they correct this. I'd arrived back from skiing early in the morning. I'd woken up to a call from Pete to see if I wanted to come flying at lunch time. It had been approx 3 months since the last time I flew and god knows where all the kit was or in what state it was in. 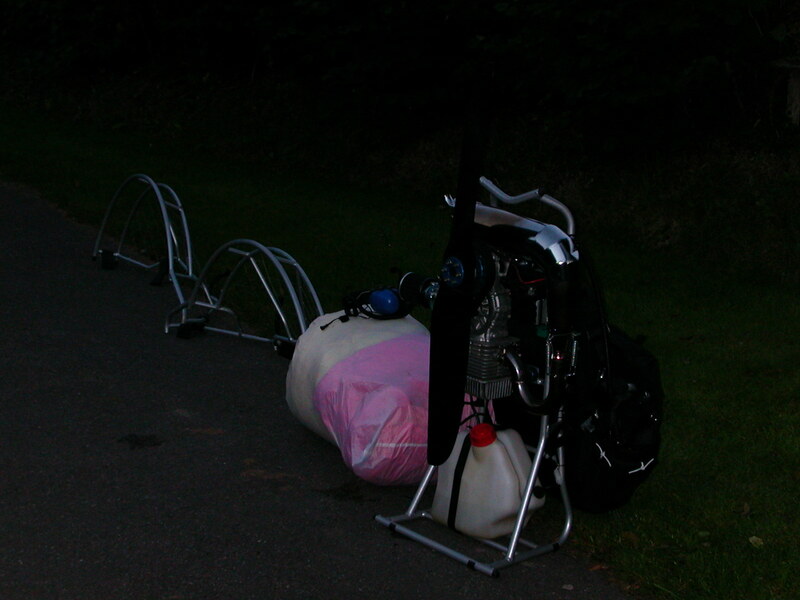 I quickly put a charger on the paramotor battery and then began stuffing things into the car. I raced down to Kent and arrived to find everyone warming their engines up in the field. Looks like I wasn't even going to have enough time to get worried about taking off! I assembled the machine filled it with fuel, did a few checks and pressed the button to start her up. Nothing. I pressed again and was met with a faint click. This wasn't looking good as it seemed the battery was dead even though the charger said it was fine. Pete tried to jump start the old girl with a spare battery - it didn't have any charge in it, we wheeled over a motorcycle but that had a dead battery too. Eventually we hooked it up to one of the guys cars and she fired into life. 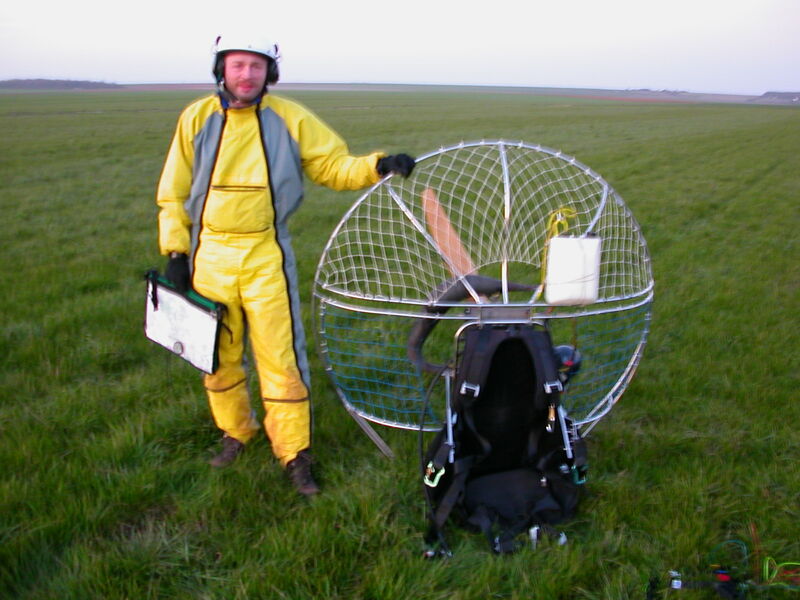 I was now the last one to get into the field so they plonked me on the back of a tractor and took me down with the paramotor still strapped to my back. There was of course no wind which meant I was going to have one of my traumatic forward launches. In the end I had 3 traumatic failed launches and after a pep talk from Jim a succesfull traumatic launch. I was the first to take off as they guessed I might take a bit more coaxing into the air so I set off to Bewl water to wait for everyone. 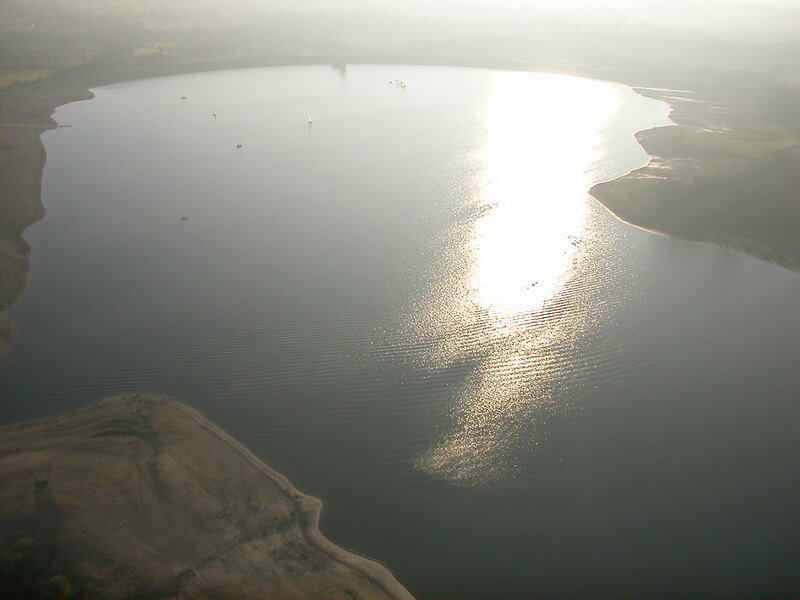 One thing I noticed was how low the water level was - it looks like we're going to have a water shortage at this rate. I kept circling around but only every saw one machine floating around. I was also keeping an eye out for the chap who was circling the globe by plane and was intending to land in Kent - it would be nice to give him a wave. I finally spotted everyone else in the distance heading off in a different direction to me (I'm very poor with directions!) so I set off after them. It was very cold up in the sky and my nose was streaming - sadly there's nothing to really do about this apart from blow every now and then and hope you stay clear. For some reason I seemed to be using a tonne of fuel and by the time we'd arrived at Camber Sands I was down to just under 3 litres. I'd heard they were planning on flying back from Camber and knew I couldn't hang around so I just turned and set off back to the field. I could see that I was using more fuel than normal and I had that terrible suspicion I wasn't going to make it home. I was now flying with the wind so maybe I could get 28-30 mph and it would have helped if I could of reached the trimmers to put them on a slow setting so I could of backed off on the throttle but saddly my shoulder injury wouldn't allow me too reach them. Things were going ok when I came to a large forest, it was still 3 miles to Pete's field but I only had 0.5 litres left - I decided to try and cross the forest (I had quite a good altitude but...) and see how close to Pete's I could get. It turned out I only just cleared the forest as the engine died. I'd been continually looking for landing fields, wind direction, power lines etc so I felt quite comfortable this time when it went quiet. I did lots of turns and landed gently in a field beside a big house. I packed the wing away and walked over to the house. It was a stables and the lady who owned the place had had quite a few things land in her fields over the years and she was particularly pleased about having any more. I was hoping for an offer of a lift rather than a lecture and had to turn my charm up to 11/10. This is diffiuclt when you have trails of snot across your flying suit! Luckily she mellowed and helped me get my gear with a quad bike (they're good fun) and then took me and my gear back to Pete's place. Back at the field I'm talking to Jabba who's quite a skilled engine tuner and flies a similar paramotor to mine (though with a 130cm prop) and gets 2.2 ltrs/hour! I guess it would be worth while if I could get him to have a look at my machine which is currently doing around 6 ltrs/hour. All the others turn up in the back of the van and I found out I could have landed in Camber and got a lift back anyway - c'est la vie. I had loads of time to prepare this time - I checked I had everything twice and even added a few things to my check sheet and the only thing I forgot to take allong this time was the check sheet! There was a whole bunch of people at Pete's place with skills ranging from the very experienced down to those just learning to ground handle. Rather than taking off in the field next door we set of to a "training hill" which would be perfect for taking off (though not quite so good for landing). The weather looked great to me (if it ain't raining it's great) with blue skies with cute little fluffy clouds and a good breeze which meant a reverse launch and hopefully a straight forward take off. I now put the prop covers in my seat and a bungy cord to tie everything up and prepare it for transport in case I land out. This now goes in the zip pocket beneath the seat allong with the small wing bag. I was all set up and ready to go and Pete was explaining to a couple of new guys that they should never go up first so I decided to redo all my checks and ended up launching 2nd behind Jim - I'd already lost Jim in the sky so I set off for the far side of the valley and a general wander about. Must admit those little fluffy clouds were growing in size and I was getting sucked up by the larger clouds - I managed to go from about 800' to 2700' in practically no time at all and with the engine on idle - I just stayed under the cloud to get some height and then shot out from underneath it to glide allong on my journey. It sounds as if I was thermalling on purpose but in actual fact it was difficult not to be thermalling in these conditions. The Suunto watch was very good for watching the altitude change - it even has vario to allow you to monitor your rate of climb or decent. Sadly I didn't check the readings under the clouds as I was quite busy just staying in my seat. Have I mentioned it was very cold again - it was cold on the ground but at 2700' it was biting. I managed to connect my electric waist coat while I was flying allong. This is quite difficult to do as the electrical connection is behind my back and not too far from the propellor so it isn't something you'd want to do unless you really are getting cold. It works well on the motor bike but I didn't really notice any difference while I was flying but my body was fine anyway - it's your hands that freeze. I might try and extend the wiring so it could have a socket on the arms of the paramotor. I later found out I'd only turned the dial on the heater to position 1 (out of 10) so I guess it wouldn't have had that much effect - perhaps I should have the jacket controls on the outside also. After an hour I couldn't feel my hands so I headed back to the field and, although it's an easy take off field, it's actually quite difficult to land back where you started from as there are tall trees at the top of the field which create rotor if you approach the field into the wind. There is a house on the right hand side of the field which objects to too much noise and so that's the second best approach gone so you're left with approaching the field quite high, then slow and then dropping down vertically into the top of the field. If you miss the top of the field then the slope of the field is such that you never actually touch down till you reach the bottom and it's a long walk back. I'm also finding it a bit tough at the moment as I have a frozen shoulder which means my right arm can't reach the controls without my left hand grabbing them first and bringing them down into reach. It doesn't help either when your hands are so cold you can't feel them at all. Luckily I managed to do a good landing pretty much on the spot but then found that once I'd brought the wing down I couldn't use my fingers to hold the wing so it all started to look a little messy - luckily one of the guys helped me out with unclipping the wing etc. I should also make my check list into a laminated booklet and fix it to the seat so I never forget it.